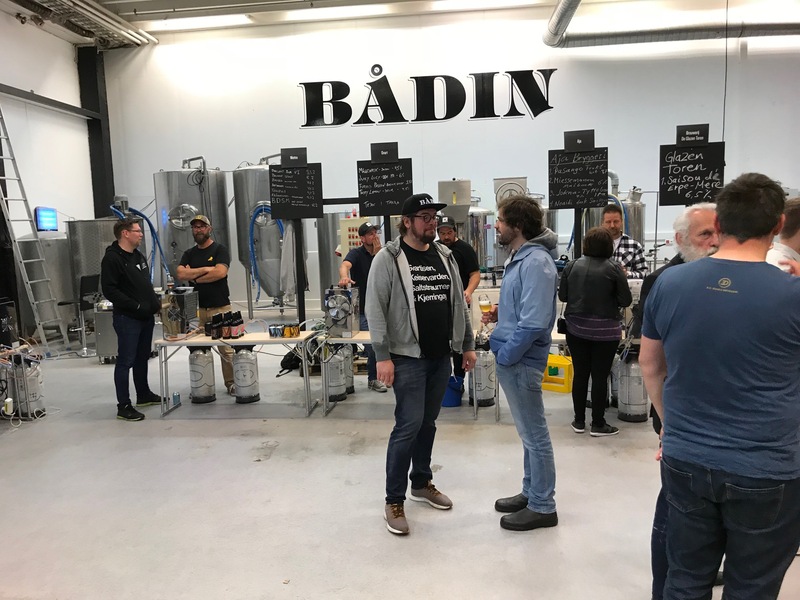 The group of friends behind Bådin Brewery shows that in this age, you can run a successful brewery just about anywhere. The town of Bodø is the second largest in Northern Norway, that means a population of 50.000. A group of childhood friends had the wild plan of setting up a brewery there back in 2012. The timing was close to perfect. They now have two full time brewers, with the other pitching in when needed. And it was all hands on deck when they arranged their second beer festival in the brewery last weekend. A merry crow of breweries were invited, most of the Norwegian, but Ugly Duck (Denmark), Hawkshead (UK). Birra del Borgo (Italy) and De Glazen Toren (Belgium) contributed very well to the occasion. Bådin has become a pride of the town, with their beers available in most supermarkets and bars. It should come as no surprise that their beers have a high drinkablility, the local market is too small for the more sour and wild end of the spectrum. And this was what the festival was all about, too. 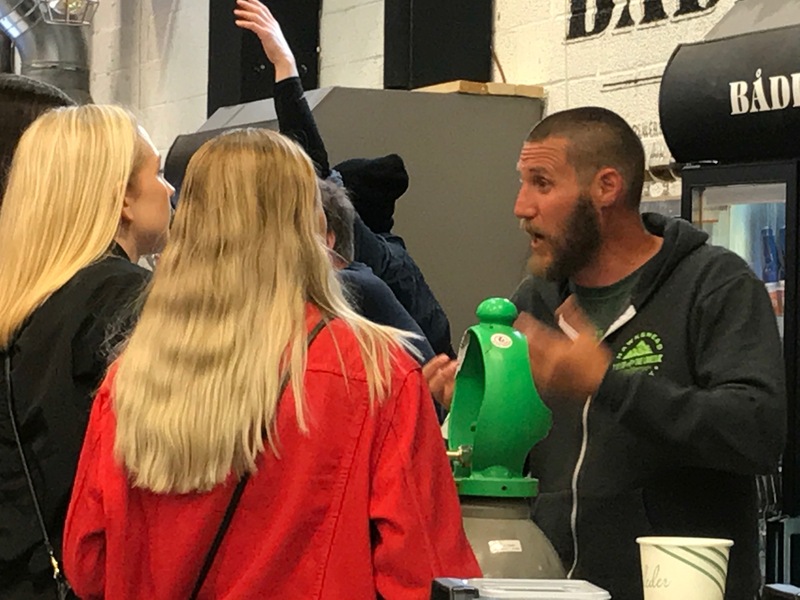 Drinkable beers and good conversations, the brewers themselves serving their brews to a public still finding out what this beer trend is all about. There was a good mix of guests, the large majority of them local. Young and old, men and women. A dozen breweries or so means you can get around the most interesting beers in a session; or maybe two. I had the pleasure of interviewing most of the brewers from a small stage, an informal chat of around ten minutes each, which I felt worked very well. The highlight of the weekend for me was having breakfast in the hotel with the amazing Jef Van den Steen from Glazen Toren with him telling anecdotes from the beer world, including his friendship with pioneering beer writer Michael Jackson. Bodø is above the Arctic circle, meaning the sun was away for just a few hours in the night. It’s a great starting point for exploring the area, including the Lofoten islands. You can go on boat trips or hike in the mountains. I hope they will make the effort to have a festival next May as well. There are good air connections, and the organizers can probably help you find moderately prized accommodation. See you in Bodø? I spent some days in Cyprus earlier this month. There are good beers to be found, but don’t expect much of the local brews. This was no beer trip as such, but obviously I kept my eyes open for interesting beers. I last visited ten years ago, and what I found was a brewpub in Limassol brewing just one pale lager . I’m sorry the photos in the old post are no longer visible, Photobucket is charging a stiff yearly fee for sharing photos which are not worthwhile. This year I stayed in Larnaca – with a one day excursion to Nicosia. I start with my apologies to the brewpub Pivo in Nicosia, it was way above 40 degrees the day I came to town, so I had to return to the coast before opening time. I have every reason to believe they have good beers. So. The 1900 Art Café Bar has a bar downstairs and a restaurant upstairs, crammed with posters and paintings. A fairly typical Cyprus menu, I had a very nice lamb and spinach stew. A good selection of Belgian beers, some other imports, but the only domestic beer was KEO. A fine place, I hope they can encourage some domestic breweries to make beer for them in the future. The main beer bar in Larnaca is the Barrel House, tucked away in a courtyard off the pedestrianized Ermou street. A quiet spot in the afternoon and early evening, getting more noisy later. A well curated beer list, including a few Greek craft beers. De Molen, Flying Dog, Kaapse, Kees, Thornbridge and De Dolle are among the breweries in the menu. And they are quite explicit: Please note we do not serve beers such as Amstel, Budweiser, Carlsberg, Corona, Fix, Heineken, Keo, Leon, Stella Artois etc. I hav a Viven Master IPA, brewed at De Proef for Beer Development Viven. A light, fruity beer, quite sweet. They could have called this a Belgian Blond instead, but it’s a nice beer. Free snacks on one of our visits, a deli counter with meat and cheese if you want to eat more. Very good service. Ask if they have something new that’s not in the beer list. A few yards away is the wine shop Cava Spiritology, which also carries some beer. There are splendid Belgians like Westmalle Tripe and Roedenbach Grand Cru, but also some Cyprus craft beers. I tried a few, but they were not too impressive. The brewery is called True Ale, they have five beers, of which I tried their Blonde Ale at 2,5% and their Pale Ale at 3%. It is difficult to brew good low alcohol beers, I think they would be better off going for stronger beers. The shelf life of this Ale is virtually limited It says on their bottles. It is most certainly not, especially not in this climate. Nevertheless, there are good beers to be found here, including a premium, well hopped lager from the Greek Delphi brewery. It is a very good shop for wine also, ask for recommendations. I bought a few bottles of an excellent Lebanese wine we had earlier at a seafront restaurant – the meze at Maquam al Sultan was the best meal in town. Then to the big disappointment – The Brewery. Presenting itself as a brewpub in a prime spot in town, they even offer a sushi/Thai buffet once a week. I was very disappointed by both the food and the drink. There is what looks like brewing equipment on the first floor, but on closer examination it is fake and dusty. It turns out they have never brewed beer on the premises at all. Our waitress tells us they buy the beer from Germany. On the plus side you get a sampler set of the beers for free, but the beers were all very dull. Pretending to have a range of nine beers, and pricing those at three times the going rate of domestic brews is not acceptable. The buffet was not up to much, either, even when the restaurant was half full, the cooks struggled to keep up with demand, and the cooking was very basic. I can recommend Larnaca as a holiday destination. The beaches are clean, the service is generally very good, the food is of high quality (though there is a tendency to deep fry similar to Scotland) and people speak good English. And the widely available national lagers, KEO and Leon, are pretty good, I found that Leon had a bit more flavor. There are import beers, too, including some cans with pretentions. Like in Italy, some people think that a German-looking Omlaut is a sign of quality. Insëlbrau was the local example. Norwegian Christmas beers have traditionally been sweet, malty beers, a relation to German Bock beers brewed for the same time of the year. December is a month when we tend to buy a lot of beer, meaning there is now a broad spectrum of Christmas beers, covering lots of styles. Some of my favorite seasonal brews from Norwegian breweries are in the strong Belgian style. Kinn has brewed Tomasmesse for several years, and Austmann offers Stille Natt. This year there is also an excellent quad from St. Hallvards. A newcomer is also this gem, Nøgne Ø Julequad. I don’t know if it is available in other countries. If you want to pair this with food, a rich and mature cheese and some walnuts should do the trick. I did a book promotion at Gummibaren in Drammen last night. No standing ovations, but a good conversation with those in attendance. Drammen is half an hour from Oslo by train. The town itself has a population of about 65000, but if you count the surrounding communities you could double that. A sizeable town in the Norwegian scale of things. Gummibaren has a fine range of beers to offer – all of them local. On tap you find local lager brewer Aass, the oldest brewery in the country. They have established their own micro brewery, and three of those beers are available, including a lager brewed with fresh spruce shots. Additionally you find beers from Eiker Ølfabrikk, Hegg Ølkompani and Haandbryggeriet. There is a good selection of beers from Aja Bryggeri, too. I really enjoyed this brand new IPA, really fresh and brewed with a liberal dose of lingonberries. Would be splendid with Norwegian Christmas fare. 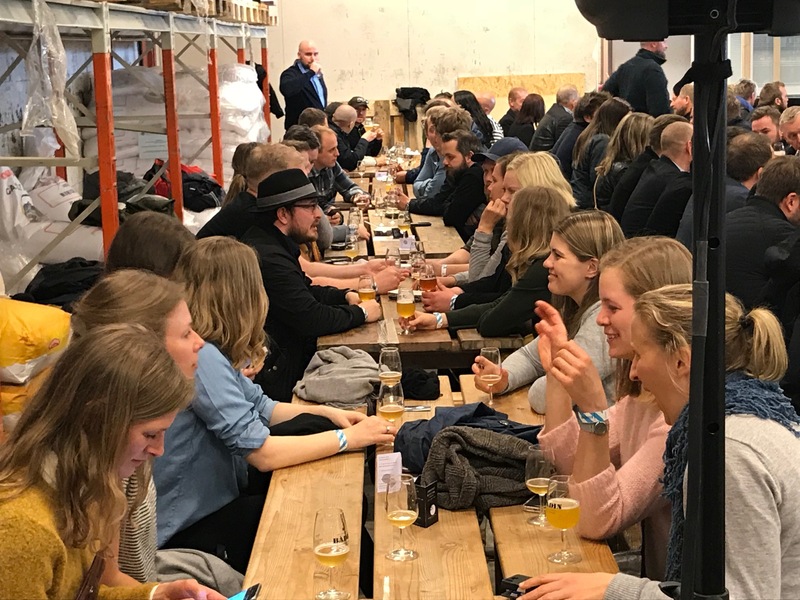 The beer scene in Berlin has been developing fast over the last few years, with micro breweries, contract breweries and beer bars popping up all over the city. I’ll get back to that. Today I’ll just mention the one factor that will really change the European beer scene, the Stone Berlin brewery. I hope to get back to presenting the brewery itself later. Today I’ll just recommend vising the bar and restaurant. This is an old brick building converted in a grand manner, with space for hundreds of people. When the outside space is developed, this will also be an splendid place on summer evenings. You don’t have to splurge on a meal, just sit down at the bar and sample some of the beers. Some are exclusives brewed here, some are barrel aged rarities from the Stone catalog. Some are guest brews from across Europe. A total of about 65 beers on tap, if I remember correctly, so it could easily turn into a long evening. A gift shop with their canned beers and various merch, too. It’s in southern Berlin, some distance from the nearest U-bahn stop, but there are buses. Google maps will help you find the way. The really good news for everyone, if we are lucky to get to Berlin or not, is that we get fresh beer from the Berlin canning line across Europe. Right now there is a Christmas stout available. I used to go to London in early December every year, and if you want a broad range of English beers at one place, including hard to find cask ales, this is the place to go. Good, inexpensive snack food, sale of books and memorabilia, obscure beers from the Continent and stronger beers to take home by the bottle. This is organized by the East London and City branch of CAMRA, and is staffed by volunteers. Well worth a visit if you are in town. “And when they were come into the house, they saw the young child with Mary his mother, and fell down, and worshipped him: and when they had opened their treasures, they presented unto him gifts; gold, and frankincense, and myrrh” (Matthew 2:11). We all know this, of course. And Norwegian craft brewery Færder Mikrobryggeri decided to brew one beer named after all the three gifts as their seasonal offering. Gull, Røkelse and Myrra in Norwegian. Røkelse, frankincense, has a Norwegian name with association to smoke, so this beer had to have some smoke malt. It ended up at the top of the list at the most comprehensive Christmas beer tasting, hosted by regional newspaper Adresseavisen. 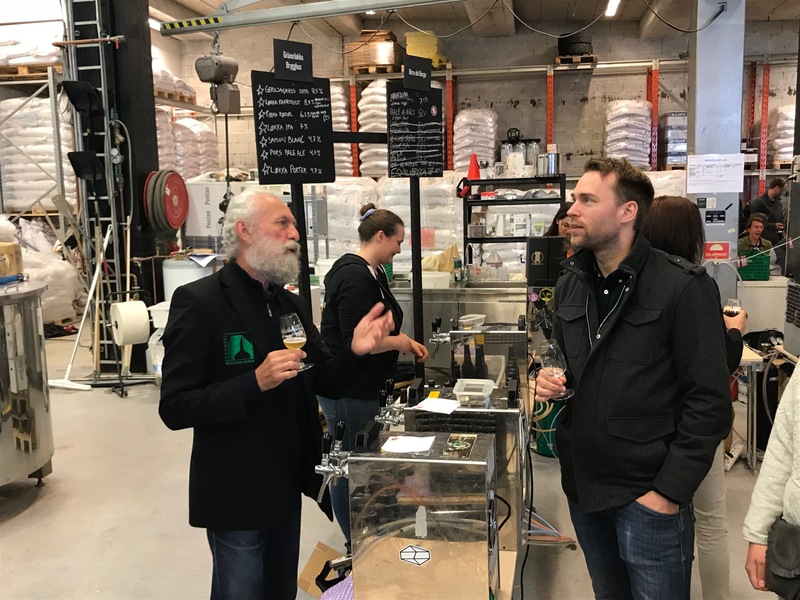 Færder Mikrobryggeri is a family business, with Mathias Krüger as head brewer. He is educated as a medical doctor, put has put his career on hold to follow his passion for brewing. His parents are also very involved in the business. You’d be very lucky to find a set of these beers now, but other Færder beers are broadly available in Norway and on the Color Line ferries between Norway and Denmark. And during the summer moths, they have a pub in the back yard of the brewery in Tønsberg, a town about an hour by train from Oslo. And it’s right by the railway station.